A new report by Persistence Market Research titled “Gelatin and Bone Glue Market: Europe Industry Analysis and Forecast, 2016–2024” performs a detailed assessment of the Europe gelatin and bone glue market over an eight year forecast period. The primary objective of the report is to offer updates and information related to market opportunities in the Europe gelatin and bone glue market. A comprehensive data analysis of the different segments of the Europe gelatin and bone glue market across the assessed regions provides a 360o forecast of the Europe gelatin and bone glue market along with useful insights capable of helping market investors and other key stakeholders make the right business decisions. In the process of studying the Europe gelatin and bone glue market, extensive research has gone into identifying the various elements that form the core components of study as well as the main factors likely to impact the Europe gelatin and bone glue market performance during the period of assessment. A concerted effort has gone into classifying the various market drivers and restraints, trends, and opportunities for players operating in the Europe gelatin and bone glue market. The report begins with a succinct executive summary that provides a singular view of the Europe gelatin and bone glue market followed by market definitions and taxonomy and an overview of the parent / associated market. The next section focuses on the key market dynamics – macroeconomic factors, demand and supply side drivers, restraints, and opportunities available for players operating in the Europe gelatin and bone glue market. Relevance and impact of forecast factors, regulations in the Europe health care market and a market forecast scenario is also covered here. This is followed by the Europe gelatin and bone glue market analysis and forecast including Basis Point Share (BPS) analysis and Y-o-Y Growth projections by country and the market value estimation by product type, application, end user, and country. Market attractiveness analysis of the different market segments across the assessed European countries is also indicated in this section. Impact analysis of key regional growth drivers and restraints based on the weighted average model along with key region-specific trends is included in the report to better equip clients with information and hidden insights. The final section of the report is devoted to the competitive landscape of the Europe gelatin and bone glue market along with detailed information on the market share held by the top companies operating in the Europe gelatin and bone glue market, their financials, business strategies, and recent developments in the Europe gelatin and bone glue market. A snapshot view of the company profiles of some of the leading market players is the highlight of this section. At the end of the report, Persistence Market Research provides key strategic recommendations for both existing and new players in the Europe gelatin and bone glue market to emerge sustainably profitable. Exhaustive primary and secondary research forms the core of Persistence Market Research’s tested research methodology for forecasting the Europe gelatin and bone glue market performance over the assessed period. Data thus acquired is sliced and diced based on the relevant parameters and further validated using the triangulation method and finally scrutinized using advanced tools to glean pertinent qualitative and quantitative insights into the Europe gelatin and bone glue market. All the insights provided in this report are supported by relevant metrics estimated for the various market segments across the assessed countries. The report is a comprehensive bundle of useful market insights and critical data points pertaining to the Europe gelatin and bone glue market, and is intended to provide readers with a magnified view of the Europe gelatin and bone glue market for the next eight years. There is an increasing adoption of gelatin and bone glue in orthopedic surgeries in Europe and this is expected to boost the demand for gelatin and bone glue in the region over the forecast period. Also, the surging demand for surgical sealants in orthopedics can be attributed to high effectiveness and strong bond strength. 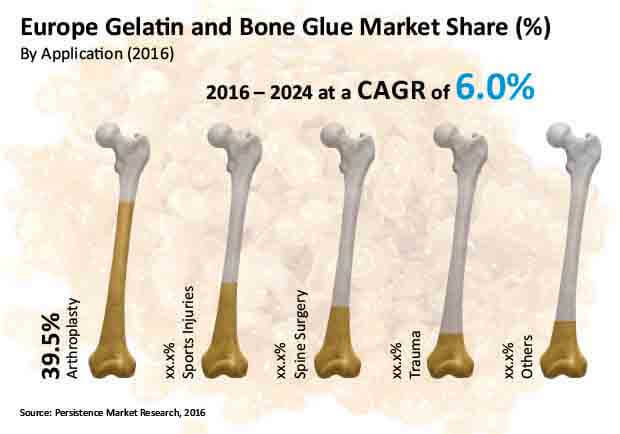 Growing usage of bone glue for osteoporotic spine is anticipated to drive the demand for bone glue in the Europe gelatin and bone glue market over the forecast period. In terms of value, the Europe gelatin and bone glue market is estimated to expand from a value of US$ 155.9 Mn in 2015 to a market valuation of US$ 260.5 Mn by 2024 end at a CAGR of 6.0% during the period of assessment. The rising prevalence of bone related disorders is the key factor that is significantly responsible for the growth of the Europe gelatin and bone glue market. Also, an increasing number of arthroplasty procedures and increasing demand for newer bone glues and tissue sealants in the region is also fueling the growth of the Europe gelatin and bone glue market over the forecast period. Product line extension and new product innovations are the factors expected to drive the Europe gelatin and bone glue market. The increasing spending on healthcare per capita and cost containment measures to reduce healthcare burden in European countries is also expected to boost the Europe gelatin and bone glue market over the forecast period. However, complications related to cemented arthroplasty is the major concern which may hamper the demand for gelatin and bone glue products and hence restrain the growth of the Europe gelatin and bone glue market during the forecast period. The approval scenario and limited applications of few wound care products is also likely to hamper revenue growth of the Europe gelatin and bone glue market during the forecast period. Based on application, the Europe gelatin and bone glue market has been segmented into Arthroplasty, Sports Injury, Spine Surgery, Trauma and Others. The Arthroplasty segment dominated the Europe gelatin and bone glue market in terms of revenue in 2015 and the trend is projected to continue throughout the forecast period. Spine Surgery is expected to be the fastest growing segment over the forecast period, owing to increasing prevalence of spinal injuries and bone disorders in Europe. In terms of CAGR, the Sports Injury segment is expected to be the second fastest growing segment over the forecast period. Some of the key players operating in the Europe gelatin and bone glue market include Johnson & Johnson, Baxter International Inc., CryoLife Inc., C.R. Bard Inc., Luna Innovations Incorporated, B. Braun Melsungen AG, Cohera Medical, Inc., Integra LifeSciences Corporation, Tissuemed Ltd., and Chemence Medical, Inc. The abovementioned key players contributed approximately 73.0% revenue share to the Europe gelatin and bone glue market (approximately US$ 113.6 Mn) in 2015. The other market players contributed approximately 27.0% revenue share (approximately US$ 42.0 Mn) in 2015. The key players in the Europe gelatin and bone glue market are emphasizing on specific strategies related to new product development, new product launch, market consolidation initiatives, acquisition, collaborations and strategic partnership activities to strengthen their market position and business expansion in the region. Companies are also focusing on increasing their manufacturing capacity to achieve economies of scale and to serve different markets to improve their geographic foothold in the Europe gelatin and bone glue market.